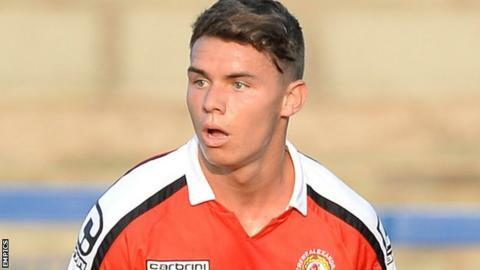 An injury-time goal from Billy Waters sent Cheltenham top of the National League with a point against Braintree. Anthony Edgar's 25-yard shot in the 90th minute looked to have won it for the visitors at Whaddon Road. But a deflected header from Waters forced a flying save from Will Norris moments later, before the former Crewe man took it around the keeper to level. Amari Morgan-Smith had a chance to win it for the hosts in the final moments but his shot from an angle was saved. Cheltenham go top by virtue of having a better goal difference than Forest Green, while Braintree drop two places to eighth. Both sides had decent chances in the opening exchanges as Jack Munns came close to putting the home side ahead, but his curling effort went just wide. Robins' keeper Dillon Phillips twice denied Simeon Akinola with excellent saves in the first half, keeping out his deflected shot and long-range effort. Cheltenham's Danny Wright hit the bar and, at the other end, a left-footed shot from Dan Sparkes also came back off the woodwork. Wright then hit the post after the break and Amari Morgan-Smith's chip was cleared off the line by Matt Paine, before the dramatic final minutes. "After 89-90 minutes we were 1-0 down and it was looking like a Tranmere-type game where we have a lot of possession and the opposition take a chance. "At that point we got a head of steam up, had quite a few corners and we got in a few times, but it was only at the end when we looked like taking the game. "I suppose it's how far we've come that we go top of the league and everybody's a bit disappointed. "The boys were a bit disappointed but for once I've tried to pick them up because I know those games are difficult." Match ends, Cheltenham Town 1, Braintree Town 1. Second Half ends, Cheltenham Town 1, Braintree Town 1. Attempt saved. Amari Morgan-Smith (Cheltenham Town) left footed shot from the left side of the box is saved. Goal! Cheltenham Town 1, Braintree Town 1. Billy Waters (Cheltenham Town) right footed shot from the right side of the box to the bottom right corner. Attempt blocked. Billy Waters (Cheltenham Town) right footed shot from outside the box is blocked. Goal! Cheltenham Town 0, Braintree Town 1. Anthony Edgar (Braintree Town) left footed shot from outside the box to the bottom right corner. Assisted by Sean Marks. Will Norris (Braintree Town) is shown the yellow card. Attempt missed. Harry Pell (Cheltenham Town) right footed shot from the right side of the box misses to the right. Attempt saved. James Rowe (Cheltenham Town) left footed shot from outside the box is saved. Attempt saved. Harry Pell (Cheltenham Town) header from the centre of the box is saved. Assisted by Robert Dickie with a cross. Robert Dickie (Cheltenham Town) is shown the yellow card for a bad foul. Foul by Robert Dickie (Cheltenham Town). Kyle Storer (Cheltenham Town) wins a free kick. Offside, Cheltenham Town. Harry Pell tries a through ball, but Harry Pell is caught offside. Substitution, Cheltenham Town. James Rowe replaces Jack Munns. Attempt blocked. Harry Pell (Cheltenham Town) right footed shot from outside the box is blocked. Attempt saved. Amari Morgan-Smith (Cheltenham Town) left footed shot from the left side of the six yard box is saved. Substitution, Cheltenham Town. Billy Waters replaces Jack Barthram. Attempt saved. Anthony Edgar (Braintree Town) right footed shot from outside the box is saved. Attempt saved. George McLennan (Cheltenham Town) left footed shot from outside the box is saved. Substitution, Braintree Town. Anthony Edgar replaces Chez Isaac because of an injury. Will Norris (Braintree Town) wins a free kick. Foul by Jack Munns (Cheltenham Town).